Poetry is literary expression in which language is used in a concentrated blend of sound and imagery to create an emotional response; essentially rhythmic, it is usually metrical and frequently structured in stanzas. 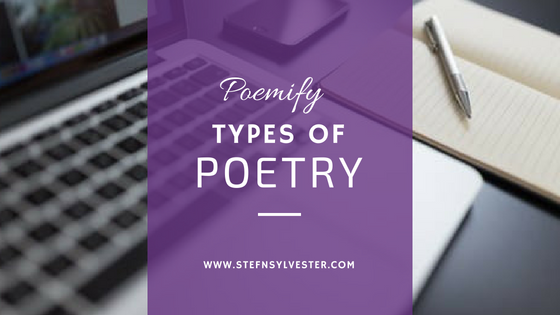 This is to help you get acquainted with the various forms of poetry existent and help broaden your art. There are more than a hundred types of poetry. I will break them into 10 bits. I'll do this alphabetically. We start with the As. For sake of time, I couldn't give examples of 'all' types listed. But there are few examples given. Noticed how each line of the above poem begins with the successive letters of the alphabet? 2. Abstract Poetry - Poetry that aims to use its sounds, textures, rhythms, and rhymes to convey an emotion, instead of relying on the meanings of words. 3. Academic Verse - Poetry that adheres to the accepted standards and requirements of some kind of "school." Poetry approved, officially, or unofficially, by a literary establishment. Desperately need for earthquake to do so. - written by TlvGuy, an Israeli poet. 5. Accent - The rhythmically significant stress in the articulation of words, giving some syllables more relative prominence than others. In words of two or more syllables, one syllable is almost invariably stressed more strongly than the other syllables. In words of one syllable, the degree of stress normally depends on their grammatical function; nouns, verbs, and adjectives are usually given more stress than articles or prepositions. The words in a line of poetry are usually arranged so the accents occur at regular intervals, with the meter defined by the placement of the accents within the foot. Accent should not be construed as emphasis. 6. Accentual Meter - A rhythmic pattern based on a recurring number of accents or stresses in each line of a poem or section of a poem. 7. Acephalexis - initial truncation (the dropping of the first, unstressed syllable at the beginning of a line of iambic or anapestic verse). Exclaim in sweet satisfaction, at last. 9. Adonic - A verse consisting of a dactyl followed by a spondee or trochee. Spondee: It is a foot consisting of two long (or stressed) syllables. Trochee: A reverse of iamb. Also, a foot consisting of one long or stressed syllable followed by one short or unstressed syllable. for one of your smiles.